These are the best kept secret fitness retreats in Costa Rica. This 6-day fitness retreat will meet any level of fitness! The classes are geared toward getting fit outdoors, and doing fun and interesting workouts that you can’t do in a gym. Think- beach, jungle, and open-air studio workouts! Our team of fitness instructors love to get creative and make workouts so fun you will forget you’re even working out. They will allow you to explore the beautiful area, while feeling fit and refreshed while on vacation. 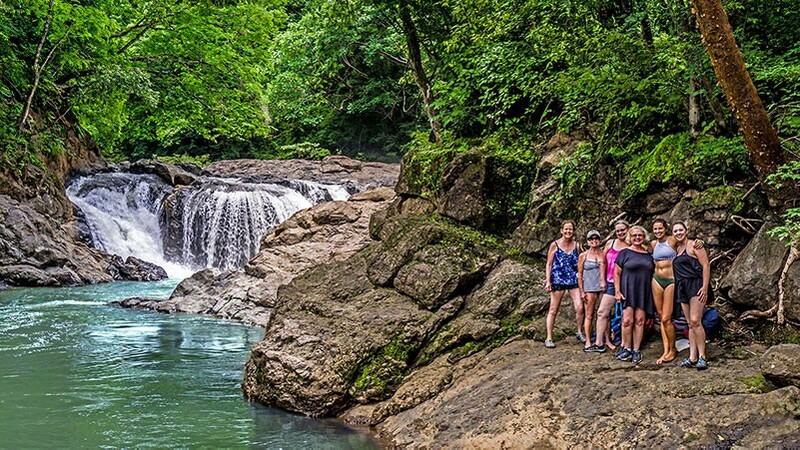 Our carefully curated 6 day adventure retreats include daily adventures to off the beaten path spots in Costa Rica. Adventure like a local and choose one of three tracks as your focus and let our guides and coaches dazzle you in the world’s most exotic tropical location. Our retreats are perfect for couples and groups as each individual may choose a preferred daily activity track of yoga, surf or fitness, but the entire group stays together, and enjoys adventures and meals together. Playa Samara is a perfect paradise for fitness retreats in Costa Rica. The town is nestled in the beautiful green hills of the famous Nicoya Blue Zone on the Pacific Coast of the peaceful Central American nation. Fernanda and Adriel, a wife and husband team from San Jose Costa Rica, are the owners and trainers at Samara Fit and Healthy Vacation Retreats. Both Fernanda and Adriel are certified physical fitness trainers with multiple certifications in the health and wellness fields. Their years of dedication and expertise bring together a wide range of techniques and styles including cardio, resistance, Zumba, boxing, kick boxing and martial arts, all blended together to create a program that will keep you interested and entertained while you reach your personal fitness and mental goals. Their passion is to help people change their habits and improve their physical condition allowing for a better quality of life. All our fitness adventure retreats are US$1295 per individual. Each includes 7 nights accommodations, 2 meals daily, airport pickup and adventures and activities listed below. Enjoy simple and comfortable accommodations in our Costa Rican style bungalows tucked away in the heart of Playa Samara just seconds from the beach. Each 2 or 3 bedroom bungalow is fully furnished with a fully equipped kitchen, bathrooms and living room. Single or double bedrooms are available as well as studio apartments. Enjoy the swimming pool, lush gardens, WiFi access, hot water showers, and fans. A/C is available at an additional charge. Have you ever been traveling somewhere and you feel like you are just doing the things tourists do, and that there must be some secret gems that only the locals know about? These fitness retreats in Costa Rica provide you with just that—explore hidden gems and local favorites as you discover the Nicoya peninsula while exercising daily.